Driven by new computer and digital fabrication tools, the architectural designs that are being built are pushing boundaries of form, customization and construction. Pushed by practices wanting and needing to produce novelty, computer-aided design systems are increasingly parametric – that is, they represent designs that change with their input data. Such systems give more control and capability to designers, but require much more comprehensive understanding if they are to be used effectively. Mastering these ideas requires skill as designer, mathematician and computer scientist. 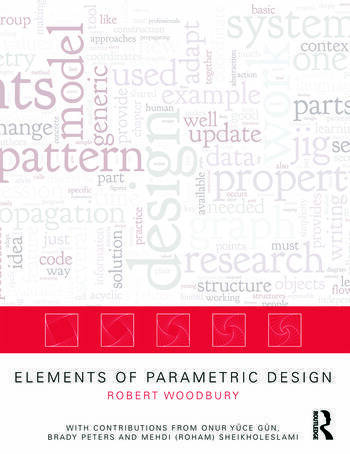 This book teaches what new knowledge and skills designers need to master the parametric and how they can learn and use it. It demonstrates clearly how using patterns to think about and work with parametric modelling helps designers master the new complexity of the design systems. Robert Woodbury is a professor in the School of Interactive Arts and Technology at Simon Fraser University in Vancouver, Canada. His research is on how people develop and use interactive systems. Through work in computational design, people-centred systems for sustainability and visual analytics, he aims to discover general concepts and designs for systems that people find engaging and useful. He is a former Olympian and current dabbler in sailing.